The BlackBerry Torch 9860 comes with a 5 megapixel auto-focus camera which is still the highest resolution you can get in a RIM smartphone. Auto-focus prompted a sigh of relief after the experience we had with the Bold Touch 9900. The camera comes with the same unattractive interface and relatively low number of customizable settings. A shortcut bar at the bottom of the viewfinder is standing in the way of proper framing. The shutter key is unusually shaped but actually quite comfortable with distinct half-press for auto-focusing. By the way, you can set auto-focus mode to continuous. If nothing else, it's the quicker and easier way, and you can shoot with a single press of the trackpad, shutter key or the virtual shutter key. Geotagging, flash and scenes can be accessed straight in the viewfinder and those are just about the only options you get with the Torch 9860. The only other thing you can customize is image resolution, which is located in the advanced settings menu. There are no settings for exposure compensation, white balance, ISO or anything like that. There is face detection, but that is a dedicated scene, rather than a separate setting. The image quality of the BlackBerry Torch 9860 is on par with the Bold 9900 except for the macro shots thanks to the auto focus. So the photos are sighlty about average (still an achievement, given the RIM history) - there is a good amount of resolved detail and colors are pleasing. Contrast is fine, too, but the noise levels are way above average. Here go several samples so you can judge the image quality yourselves. We’ve also added the BlackBerry Torch 9860 to the database of our Photo Compare Tool. Here you can see the Torch 9860 is a decent performer and is on par with its Bold 9900 sibling. Compared to some of the most popular 5 megapixel droids such as HTC EVO 3D and Desire S, Sony Ericsson Xperia PLAY, LG Optimus 3D and Black, and Samsung Galaxy S you can clearly see the Torch 9860 is on par or even better when it comes to resolved detail and accurate colors. The lighter noise reduction plays a part in that too, it's a technique we've already met in the iPhone 4. 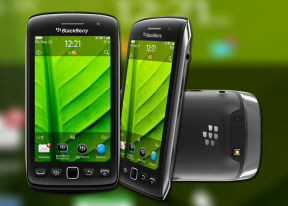 The BlackBerry Torch 9860 is part of the new generation of HD video-enabled phones by RIM - along with the Bold 9900 and Torch 9810. It is capable of shooting 1280x720px videos at 30 fps and can use the LED as video light. The video quality is up to scratch – the frame rate is good, the resolved detail is adequate, the noise levels tolerable, the colors accurate and the contrast is fine too. Our main concern is the higher compression levels applied in the processing, but that's to be expected in 3GP videos. Overall, it's thumb's up for the BlackBerry Torch 9860 videos. Here’s a 720p video sample from the Torch 9860 camera. And here is another we've uploaded to YouTube for your convenience. The BlackBerry Torch 9860 is a match for most of the HD capable smartphones and our video compare tools is here to prove it. The BlackBerry Torch 9860 is giving you a broad range of connectivity options, as you would expect from a modern day smartphone. The quad-band GSM/GPRS/EDGE support secures global roaming and the quad-band 3G with 14.4Mbps HSDPA and 5.76Mbps HSUPA gives you the extra speed. The dual-band Wi-Fi is also a nice addition with an easily customizable Wi-Fi manager taking care of all the connections. Wi-Fi hotspot is also supported. Stereo Bluetooth rounds off the list of wireless connectivity options. The BlackBerry Torch 9860 has a standard microUSB port that is enabled for both data connections and charging. Once connected, you can sync your data with the BlackBerry Desktop Software. It allows you to sync your iTunes collection, save for the files that have DRM. The Torch 9860 is not NFC-capable - only the flagship Bold Touch 9900 gets that treatment.